Acclaimed Syrian artist Tammam Azzam will be featured in Amsterdam’s cultural hub Tolhuistuin as part of a group exhibition titled 'Crisis of History Part 2: Fight History'. Opening on 8 February 2015, the show will highlight artists from the Middle East and beyond in an attempt to decode Western misconceptions of the Arab world. 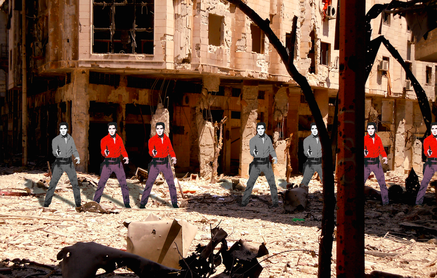 Azzam will participate with his digital works, among which Syrian Museum - a series of European master pieces digitally embedded into images of Syria’s war torn buildings. This body of work gained him worldwide recognition back in 2013 and will be exhibited alongside works by Eric Parnes, Wafaa Bilal, and other artists portraying the political ruptures between East and West.